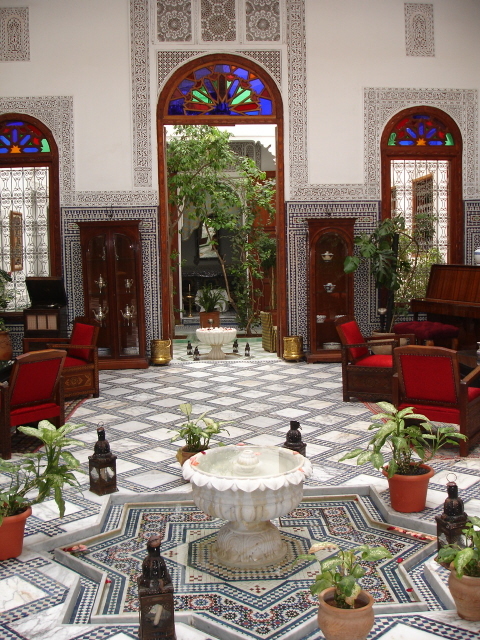 Dar Al Andalous Location. 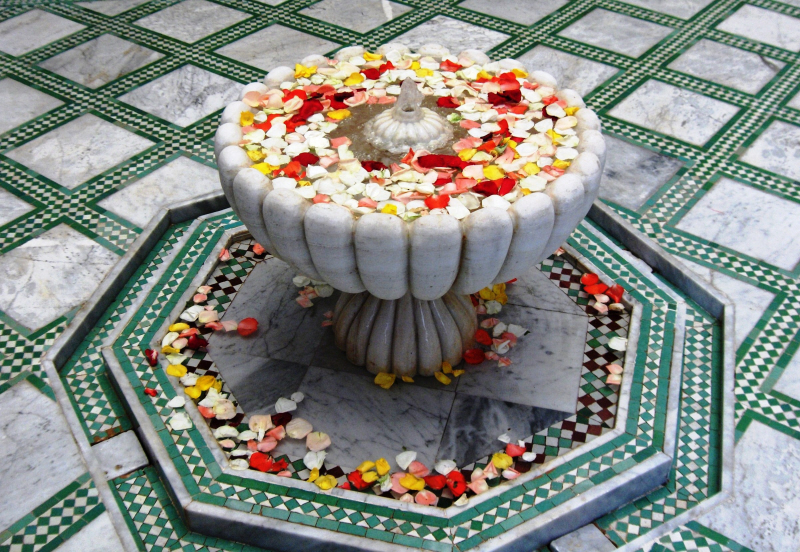 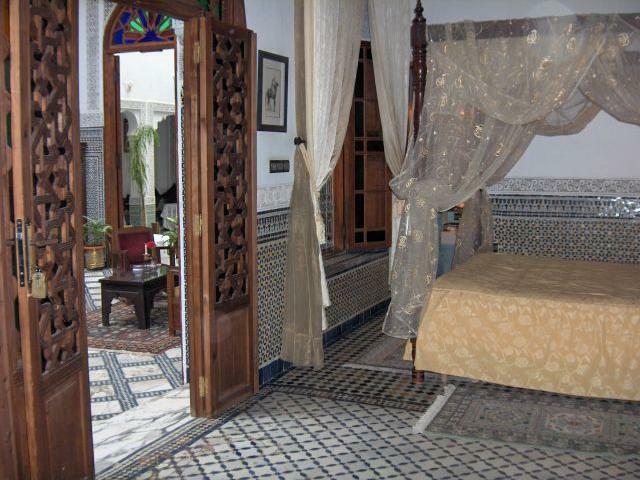 Book Dar Al Andalous Today with Hip Morocco - Holiday Accommodation in Fez, Morocco. 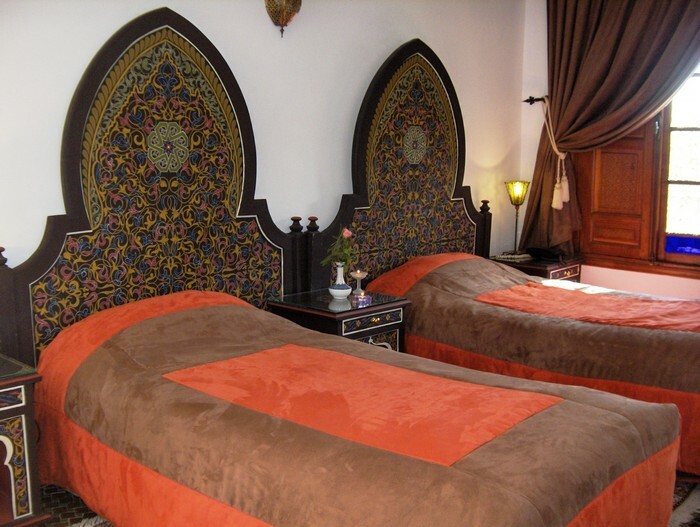 "Delicate and airy fabrics, intensives colors, and modern designer furniture in a romantic atmosphere"
Dar Al Andalous is located in the historic old town in the district of Batha, near the stunning Bab Boujloud (blue gate). 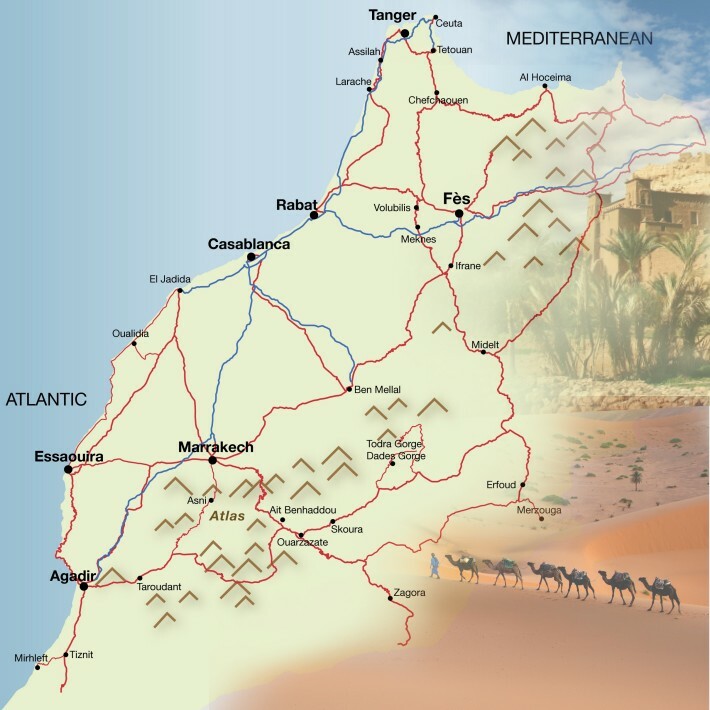 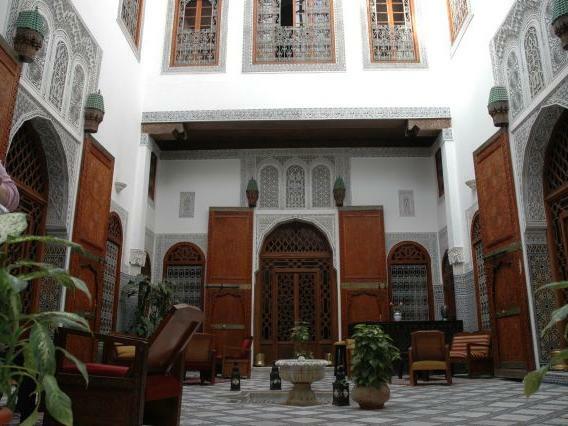 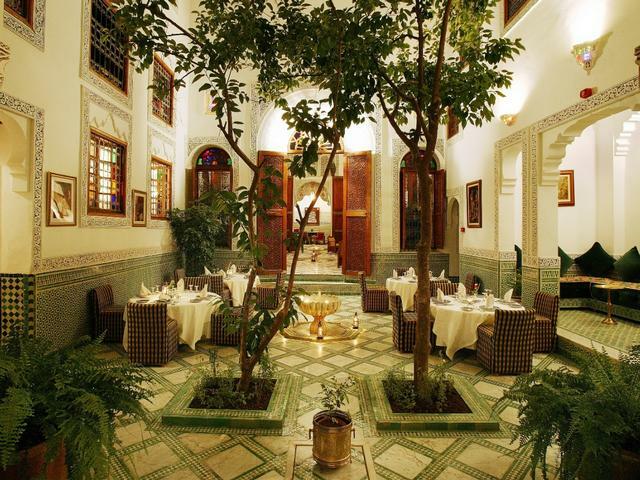 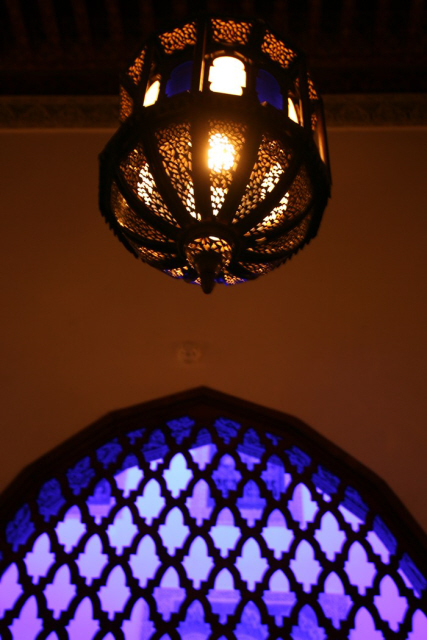 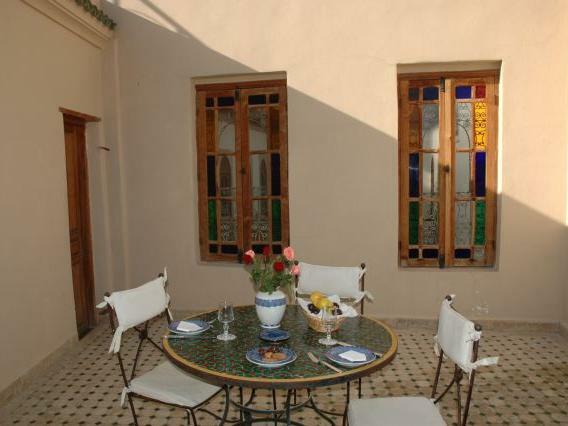 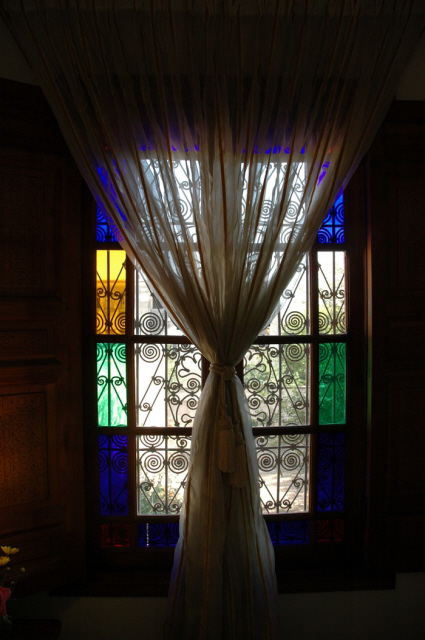 The Riad is easily reached by car and just a short walk away from an attended parking lot. 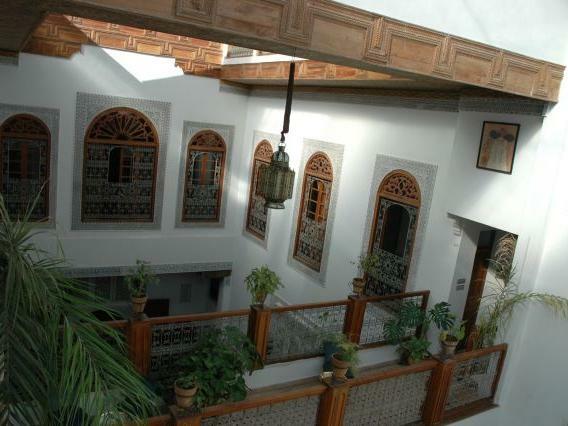 Built at the beginning of the 20th century, the two connecting buildings of Dar Al Andalous belonged to one of the richest and most influential families of Fez. 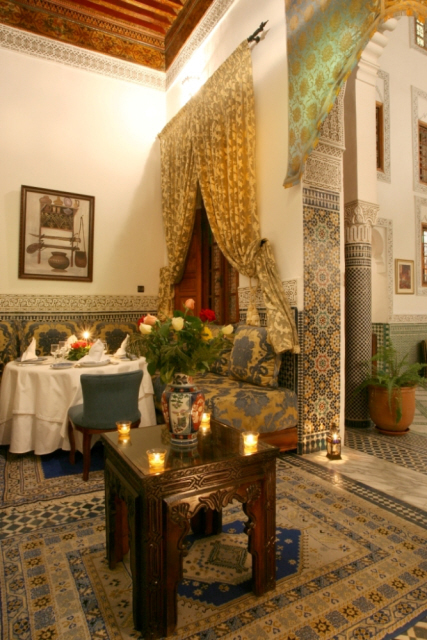 In 2002, the historic palace was renovated into a romantic Guest House whilst retaining its beautiful Arabic-Andalusian character. 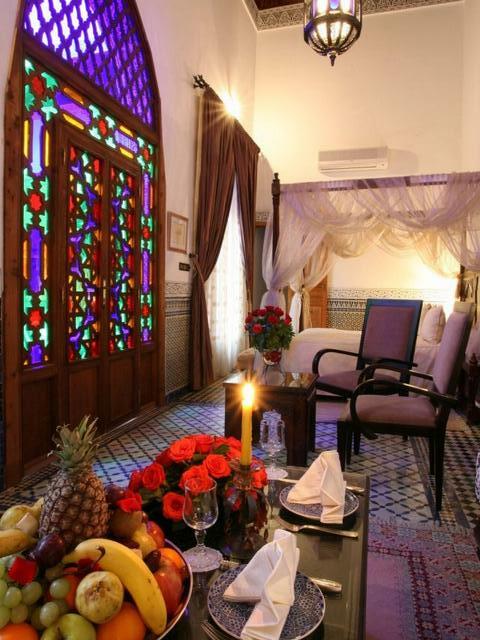 Delicate and airy fabrics, intensives colors, and modern designer furniture give the Riad an atmosphere which couldn't be more suitable for a romantic vacation in Fez. 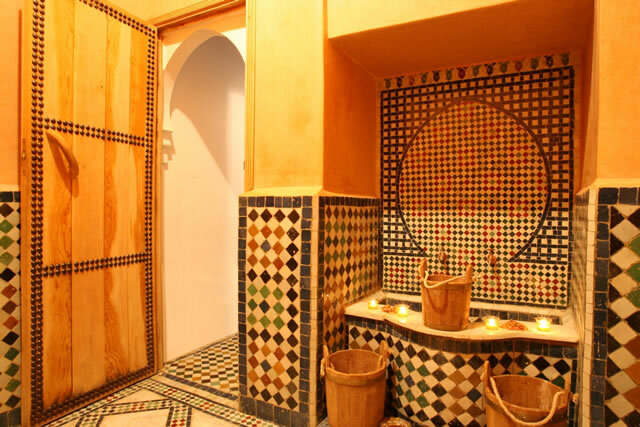 The original interior design with its elaborate mosaics, perfectly curved shapes and daedal carvings is punctuated with lovely details like white candles and lush green plants. 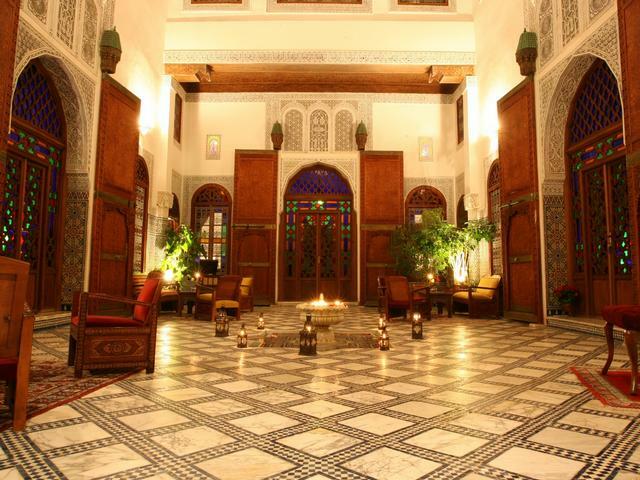 In addition, Dar Al Andalous features a magnificent terrace, a traditional Hammam (steam bath) and a cozy lounge with open fireplace. 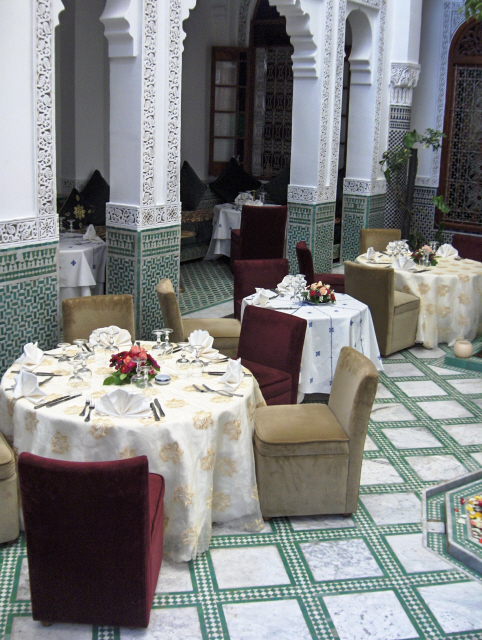 The restaurant spoils its guest with exquisite dishes based on the traditional local cuisine. 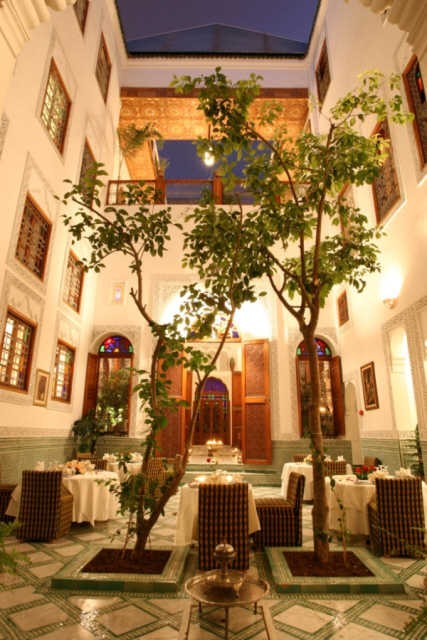 Amateur cooks can also sign up for a cooking course at the Riad to disclose the secrets of the famous Fassi art of cooking. 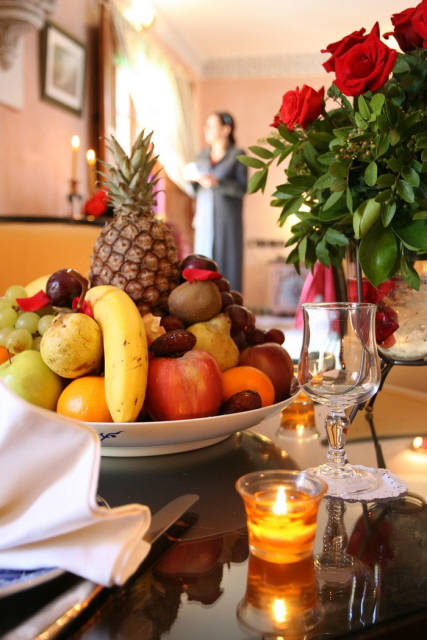 Room Facilities: Minibar, TV, Telephone, Air Conditioning, Heating. 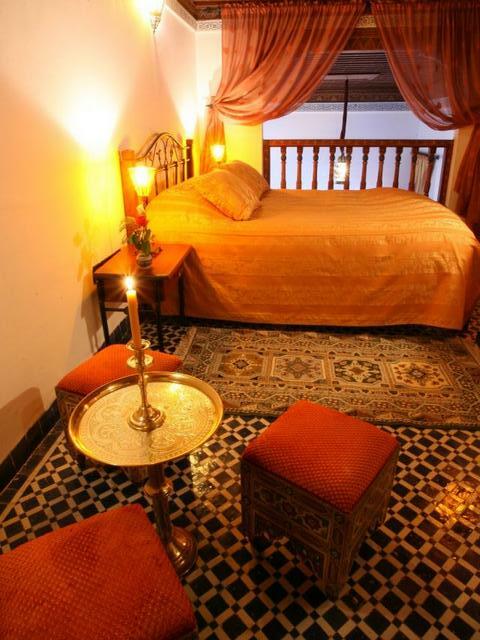 Batha is a charming twin-bedded room with ensuite bathroom with bath and a private terrace. 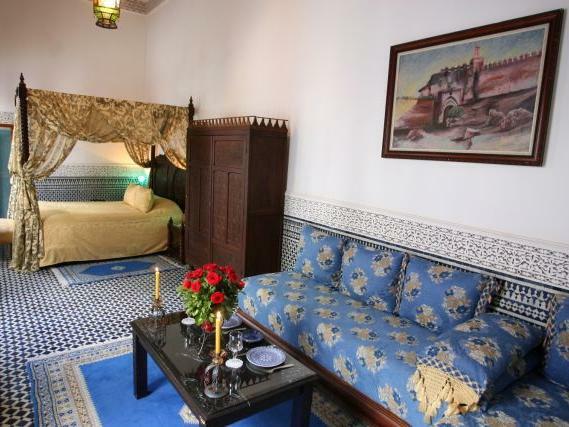 Medina is a cosy twin-bedded room, with an ensuite bathroom with bath. 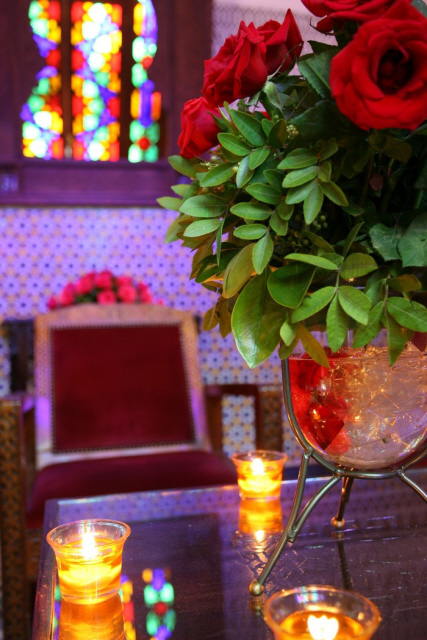 The fabulous Saadiens Suite on the patio level, has a king-size Badaquin bed, and Moroccan lounge, with the bathroom and dressing room upstairs. 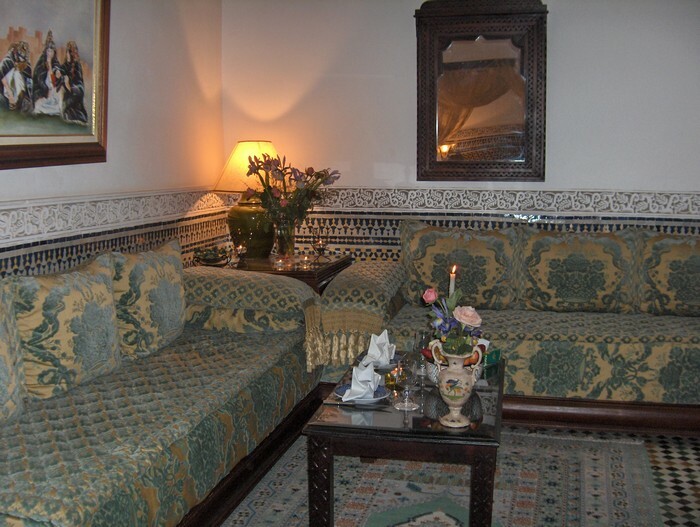 Room Facilities: Minibar, Safe, Satellite TV, Telephone, Air Conditioning, Heating. 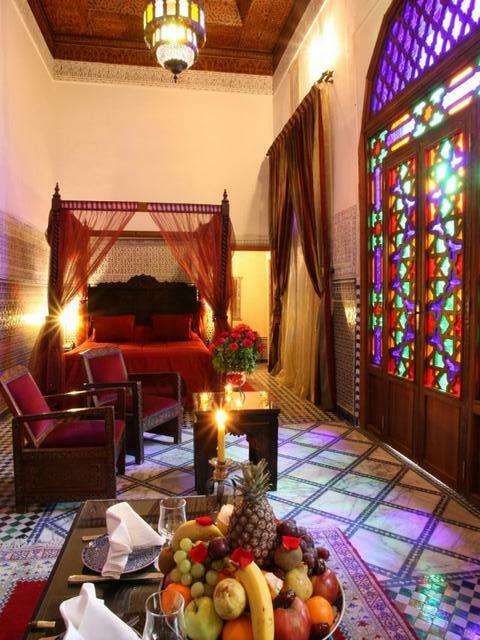 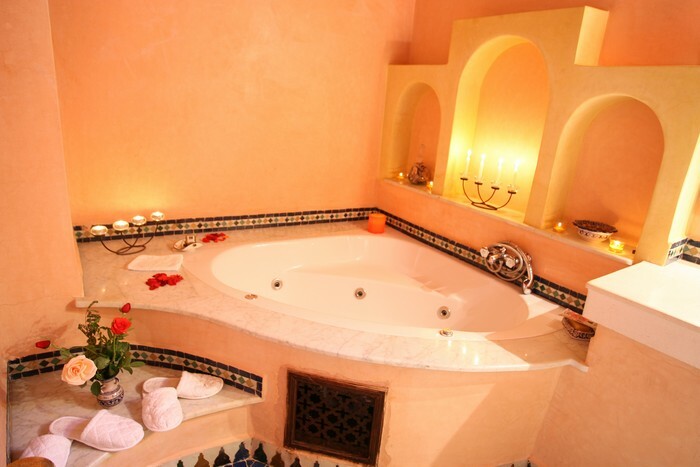 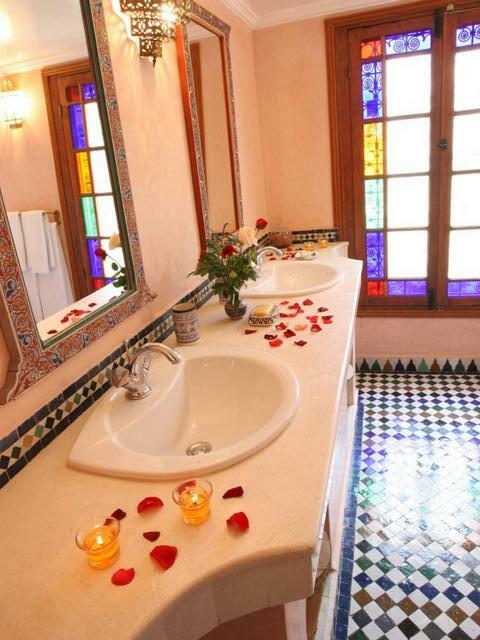 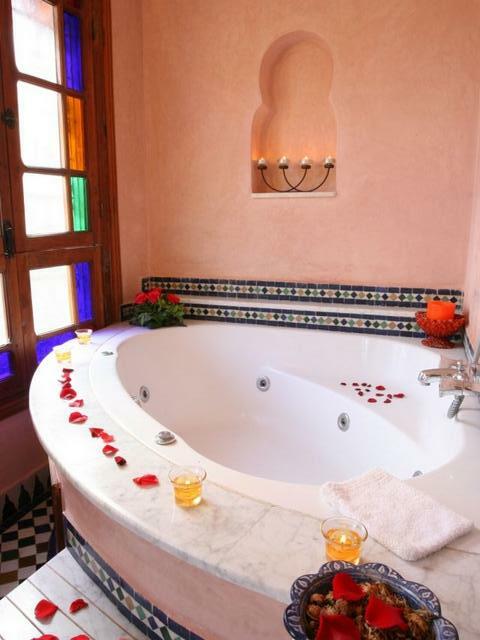 The splendid Almoravides Suite on the first floor, has a Baldaquin bed, Moroccan lounge, and ensuite bathroom with bath. 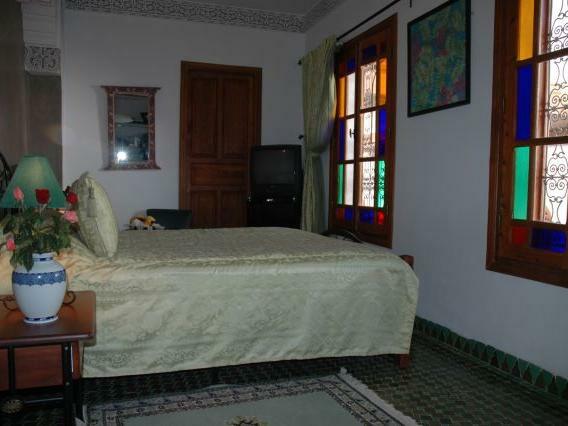 Room Facilities: Minibar, Satellite TV, Telephone, Air Conditioning, Heating. 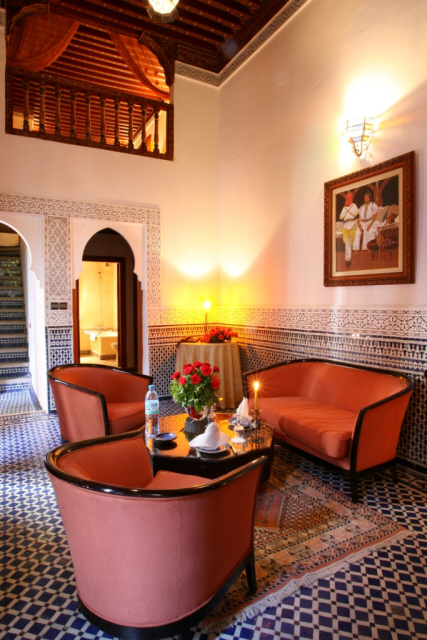 The delightfully quiet Mezzanine Suite is on the 1st floor overlooking the courtyard. 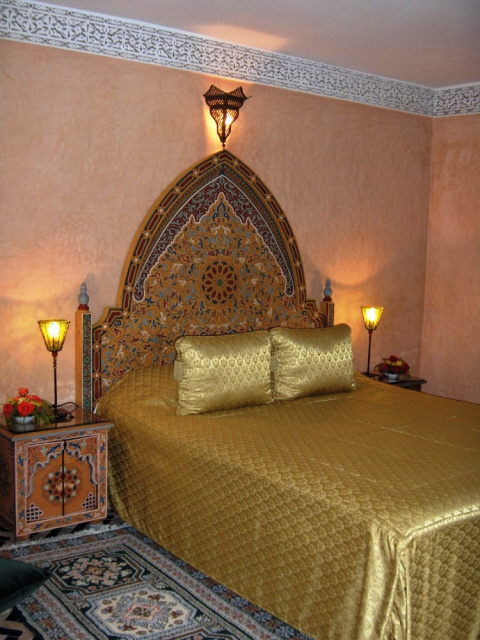 There is a mezzazine bedroom with King-size bed, a Moroccan lounge, and bathroom with bath. 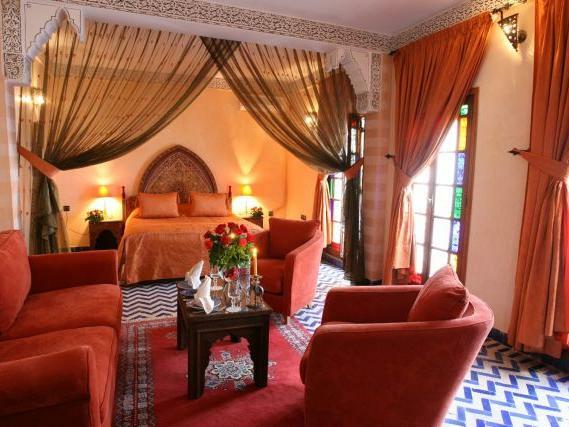 The beautiful Shehrazade Suite on the first floor, has a King-size bed, ensuite bathroom with bath, and Moroccan lounge. 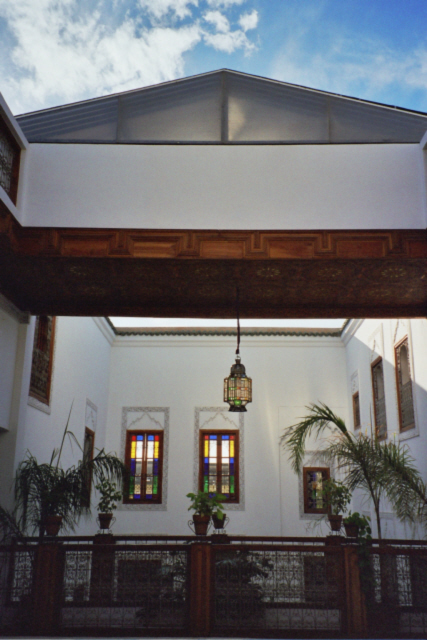 The glorious Idrissides Suite on the ground floor (courtyard), has a Baldaquin bed, bathroom with jacuzzi, dressing area, and Moroccan lounge. 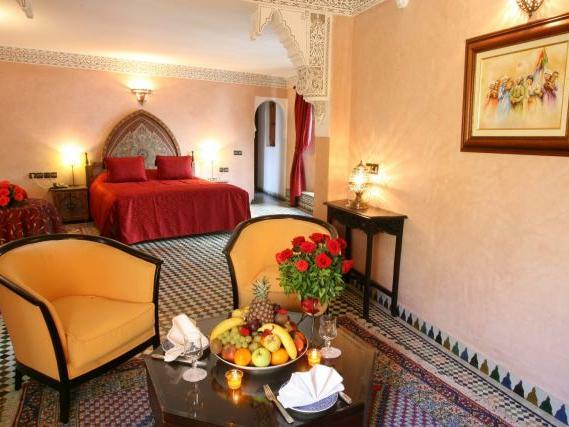 The lovely Almohades Suite on the first foor, with balcony overlooking the courtyard, has a Baldaquin bed, bathroom with jacuzzi, dressing area, and Moroccan lounge. 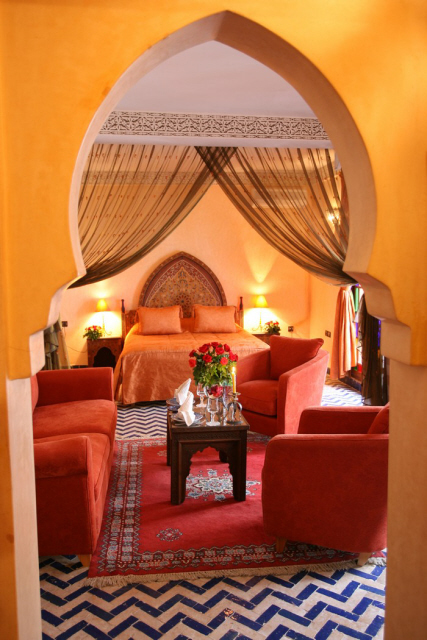 The delightful Menzeh Suite on the first floor, overlooks the second courtyard and restaurant, it has a King-size bed, bathroom with jacuzzi, dressing area, and Moroccan lounge. 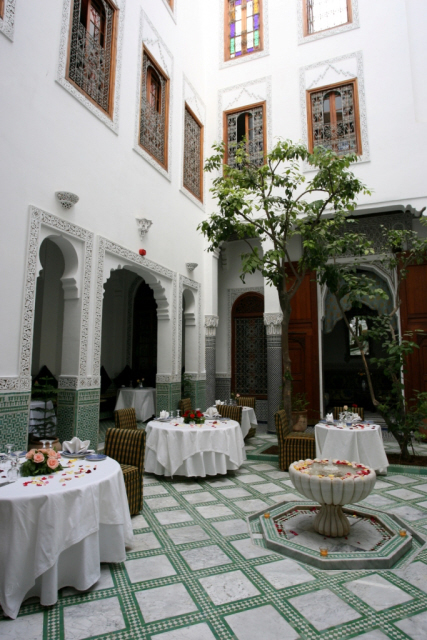 The base rate price at Dar Al Andalous is in pounds, euros, or Moroccan dirhams and exchange rates are approximate.